Parkinson’s disease is a common age-related disorder that progressively affects movements. The patients present slowness of movements, stiffness, tremor, loss of balance in early stages that can be manageable by medications. But in advanced stages, patients suffer from the debilitating degree of motor dysfunctions in combination with non-motor symptoms such as cognitive dysfunctions, hallucination and delusion, unable to live alone. Although it has been known that these symptoms mainly arise from the progressive loss of dopaminergic neurons in the midbrain substantia nigra, the underlying mechanism is unknown. One of the major obstacles in Parkinson’s disease research is that the field lacks animal models that genuinely recapitulate the progressive degeneration of brain dopaminergic neurons. The group of Emi Nagoshi has recently published a study in PLOS Genetics to open an avenue to unravel the molecular mechanisms of dopaminergic neuron degeneration in Parkinson’s disease. They used powerful invertebrate model organisms, fruit fly Drosophila melanogaster and nematode worm C. elegans, and demonstrated that the homolog of mammalian p48/ptf1-a gene – fly Fer2 and worm hlh-13 – is required for the survival of dopaminergic neurons in aging animals under oxidative stress. Fly Fer2 mutants even mimic a progressive, age-dependent degeneration of dopaminergic neurons and locomotor dysfunctions, much like the human Parkinson’s disease patients. Although p48/ptf1-a gene was not known to be involved in the dopaminergic neuron survival, Genome-wide association studies have found a SNP correlated with sporadic Parkinson’s disease within the gene. 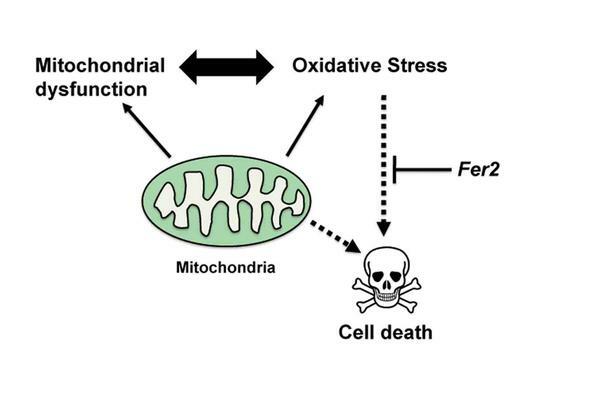 Therefore, the group’s results underscore that that wide range of genetic factors in combination with environmental factors, such as oxidative stress, can contribute to the Parkinson’s disease pathogenesis, Furthermore, the new invertebrate genetic models - fly Fer2 mutants and worm hlh-13 mutants – were proven to be valuable tools to study pathogenesis of Parkinson’s disease.